Welcome to Aria (former u suites) the luxurious suites hotel in Eilat. We promise you a pampering and relaxing holiday along with activities for both the young and the adult. Enjoy the spectacular beach with direct private access to the hotel guests. Aria (former U suites) is rated at 5 stars according to the official Israeli Ministry of Tourism hotel rating . At the Aria Eilat you can enjoy all the luxuries that will guarantee you a perfect and unforgettable vacation: gourmet meals, a spa center with a wide range of treatments and massages, an enchanting beach, a children's club with lots of fun activities, a dance bar and a modern business lounge and spacious suites equipped with modern design. The hotel staff is at your service throughout your vacation and committed to do everything in order to provide you with a luxurious vacation experience. DELUXE SUITE SEA VIEWA Large and luxurious suite with a large balcony with sea view. It is suitable for couple with 2 children or 3 adults. The suite includes a minibar, bathroom, TV screen and safe. ROYAL SUITE JACUZZIRoyal Suite with a large balcony overlooking the Gulf of Eilat with the perfect pampering - exterior jacuzzi. The suite has 2 large and fully equipped bedrooms and a spacious living room suitable for 4 adults or couple + 4 children, 3 TV's, 2 bathrooms, safe and hairdryer in bathroom. PRESEDENTIAL SUITEthe luxurious presidential suite is located on the seventh floor includes two bedrooms and a study room with a docking station, kitchen with refrigerator, a bar, a microwave, a dishwasher, a large sun terrace with an open view of the Gulf of Eilat and a luxurious outdoor Jacuzzi. 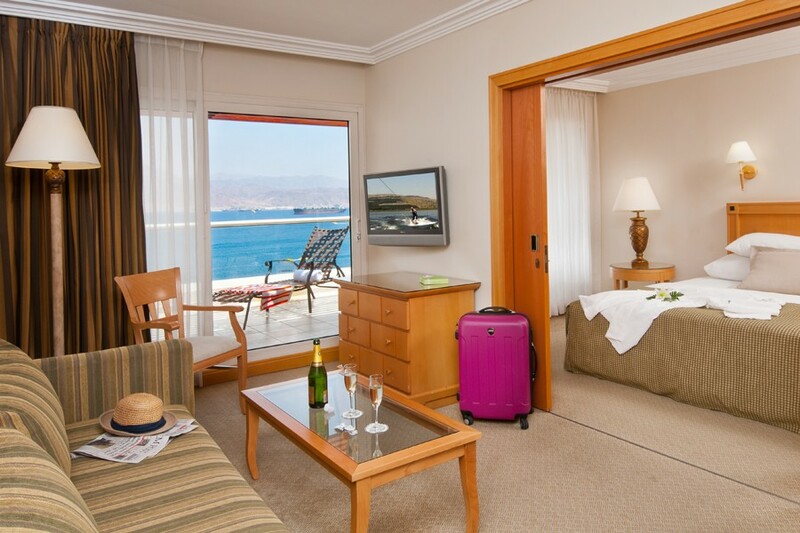 HONEYMOON SUITEThe perfect place to celebrate your honey moon in the most romantic suite in Eilat! 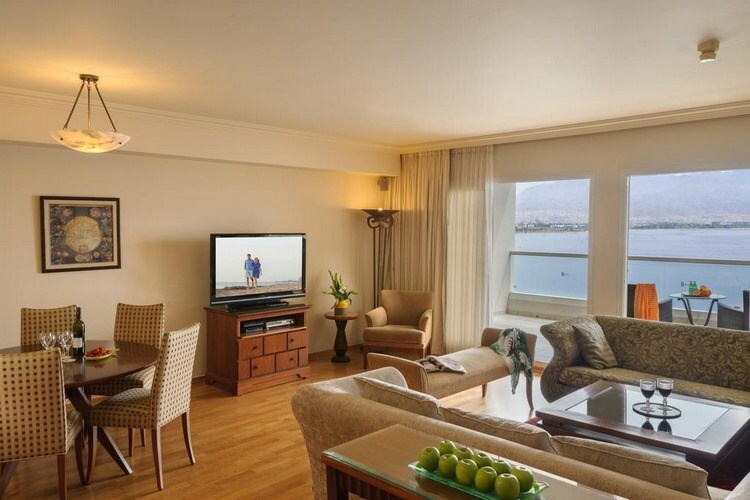 The luxurious suite, with classic vintage furnishings, includes an outdoor double Jacuzzi on the balcony overlooking the entire Gulf of Eilat and is equipped with all the luxuries that couples need for a perfect honeymoon. This suite is for couples only. 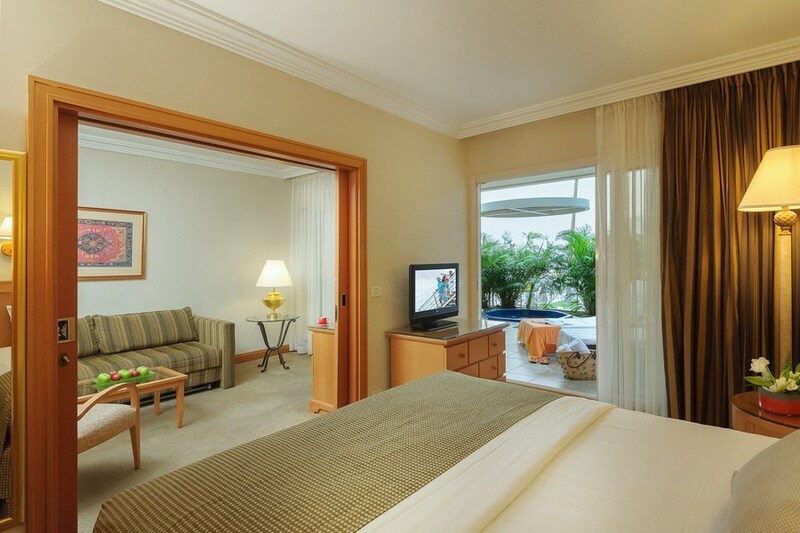 GARDEN SUITEA huge suite with 2 bedrooms, living room and a private garden with a pampering Jacuzzi in the center. The suite is suitable for a family of 4 adults or 2 couples + 4 children and includes a kitchenette, 2 bathrooms, bathroom with hairdryer. 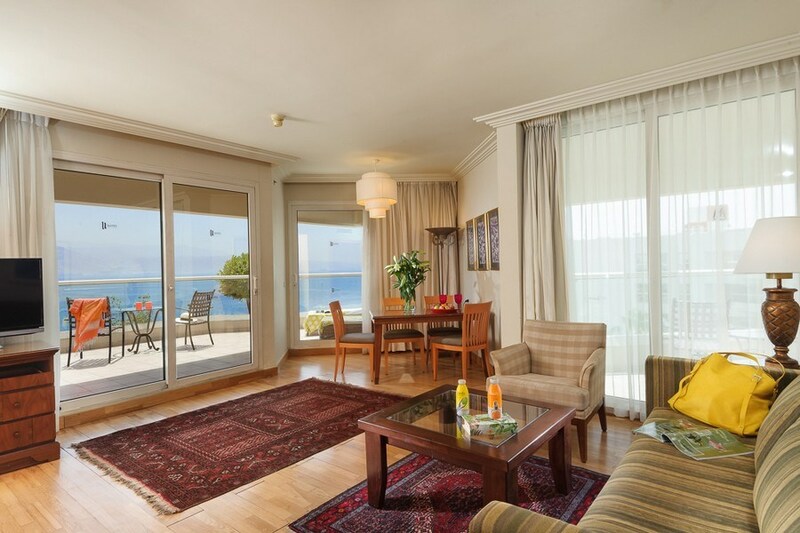 ROYAL SUITE EXECUTIVERoyal Suite located on floors 6-7 with breathtaking views of the entire Gulf of Eilat and the Red Sea. 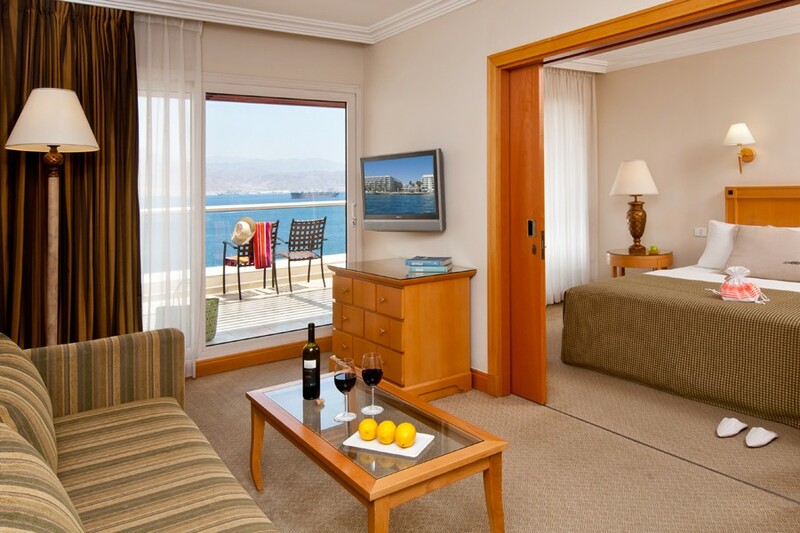 The suite consists of two large bedrooms and a living room suitable for 4 adults or cuople + 4 children. The suite has 3 TVs, 2 bathrooms, air conditioning and a bathroom with hairdryer. ROYAL SUITEtwo large bedrooms suite and a living room suitable for a group of 4 adults or couple + 4 children with an open view from the balcony to the Red Sea Bay. The suite has 3 TVs, 2 bathrooms, air conditioning and a bathroom with hairdryer. DELUXE SUITE POOL VIEWLarge and luxurious suite with a large balcony overlooking the pool. Suitable for couple with 2 children or 3 adults. The suite includes a minibar, bathroom, TV screen and safe. 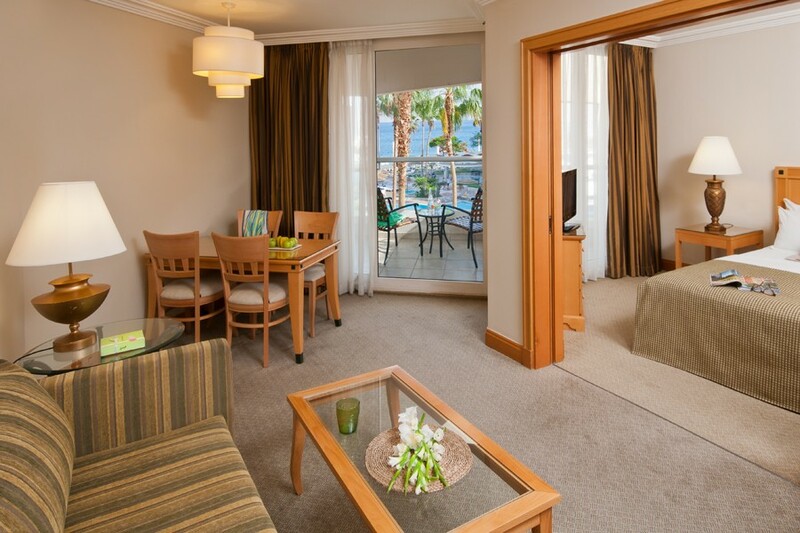 DELUXE SUITELarge, spacious suite suitable for couple with 2 children or 3 adults. 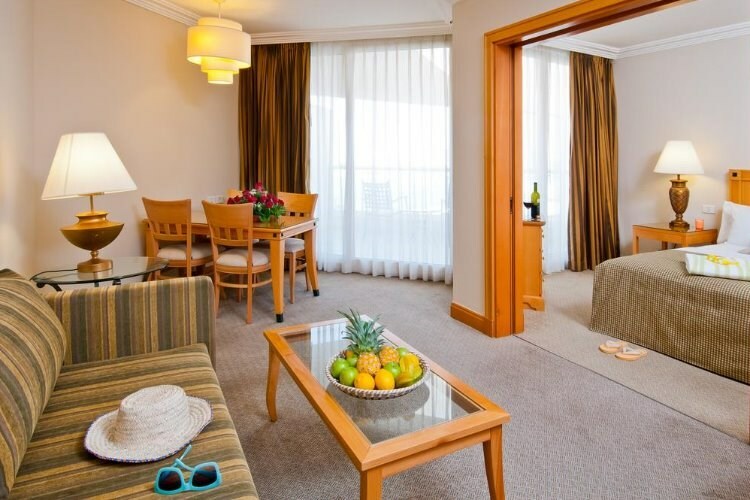 The suite room includes a minibar, bathroom, TV screen, safe and large, luxurious balcony. U Superior SuiteThe U Superior suites, sized 50 sqm, offerbedroom and living room, large sitting area with sofa bed, balcony, air conditioning, minibar, desk, telephone, coffee & tea making-facilities, television and safe. The bathroom features a bathtub, toilet and a hairdryer. U Superior Pool View SuiteThe U Superior suites, sized 50 sqm, offer balcony overlooking to the pool. All rooms are equipped with bedroom and living room, sitting area with sofa bed, air conditioning, minibar, desk, telephone, coffee & tea making-facilities, television and safe. The bathroom features a bathtub, toilet and hairdryer. U Garden SuiteThere’s room for everyone in these spacious and luxury suites which are situated on the hotel’s first floor. Guests have access to their own private garden complete with Jacuzzi, along with two large bedrooms, a separate living area and two bathrooms. Upon arrival gifts of wine, bottled water, pralines and fruit await – along with a plate of cookies. Honeymoon SuiteThere’s no more romantic spot than the Honeymoon Suite on the 7th floor. The suite features a separate bedroom and living room, with a parquet floor, luxurious and classic furniture and a Jacuzzi on the open terrace. 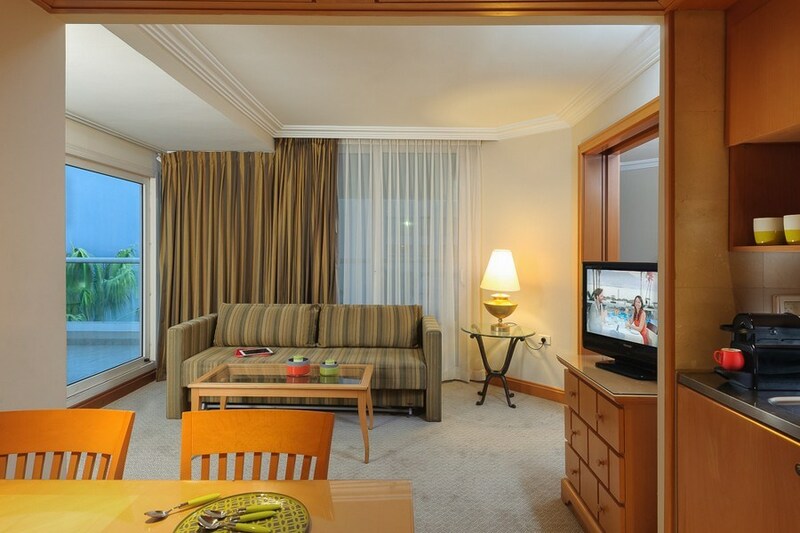 The views of the Red Sea and the pool from this Suite are spectacular. As guests at the Honeymoon Suite you’ll enjoy a line-up of treats such as wine, mineral water, pralines, fruit basket and a plate of cookies.